Bringing the best work in your house with passion and loving every piece of it, because we care not just in our company but also to the one who will use it. Creating homes more better with professionalism and placing ourselves owning the property that were doing, assuring that every single detail is polished and ready to deliver. What We Do. What We Offer. We don't just build but ensures that we make it pocket friendly work. With our professional workers we make sure things are done perfectly. Beautiful output is good but security work from quality assurance is better. Your kitchen is supposed to be the hub of the household, but it can be difficult to make it actually feel that way if it’s cramped, inefficient, or even just a little ‘blah’. There are many things you can do to make your kitchen feel more social and encourage your family and friends to want to hang out there. Here are some tricks for your kitchen remodel in St. Louis. The first and most obvious tip is to get rid of any unnecessary walls or counters that are blocking the flow of traffic in your space. When it’s easier for people to see each other, they will be more likely to want to chat and spend time together. Consider removing the wall between your kitchen and living room, or just move your island to another location to make it easier to talk to those sitting at the kitchen table. Not only will this make your kitchen feel social on a daily basis, but the more space you have in your kitchen, the easier it is to throw parties. Set up a relaxed bar area. When you’re just having a drink, sometimes sitting down at a table can feel a bit too formal. However, you don’t want to stand up the entire time either. Solve this problem by creating a bar area. If you have a counter already in place, install bar stools on one side, and a cabinet or bar cart for drinks on the other. If you’re putting in an island during your remodel, you can also install a bar there. This makes conversation feel very natural and accessible instead of too forced. Another way to add relaxed seating options is to install a bench. If you have an unused wall or window, you can take that space and put in a small nook with comfortable cushioned seating. This allows even more people to sit in your kitchen, and makes it feel very comfortable and welcoming. It’s an ideal place to relax and chat while eating breakfast in the morning or winding down at the end of the night. Be sure to include nearby lighting so that the users can properly see each other. When everyone in your kitchen has access to the glasses, silverware, and cooking tools they need, the kitchen immediately starts to feel a bit more welcoming. 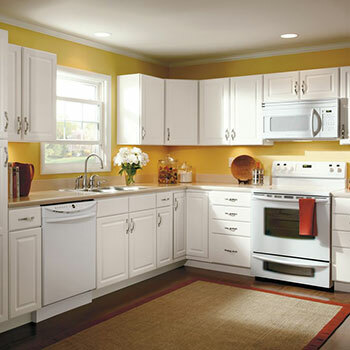 An easy way to make everything accessible is to install open shelving instead of bulky cabinets. Open shelves are very trendy right now, and if you enjoy collecting beautiful kitchenware, this is the perfect way to show it off. If you have kids, you also may want to consider installing shelving lower to the ground where they can access it, kitchens and bathrooms alike. If you can, connecting your kitchen to your back patio or deck is a very effective way to make it feel more social, because you can easily host meals outdoors when the weather is pleasant. Open up your walls and add windows to make everything feel brighter and happier, and use natural decor elements to bring in the pleasant feeling of the outdoors. Focusing on the flow of your home will make it all feel more sociable and welcoming.